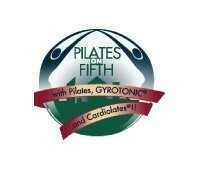 Pilates on Fifth is all about WELLNESS, offering over 100 classes a week to help you meet your fitness needs. Strengthen and tone with Pilates Reformer & Chair, or target the deep core muscles and balance on the CoreAlign®. SilkSuspension® will target the deep stabilizers of every joint to increase strength, flexibility and power exponentially. Traditional Mat Pilates Plus classes focus on the abdominal muscles and core, while Barres & Belles fuses kettlebell training with classic barre exercises for a heart-pumping, core-blasting workout. Finally, CARDIOLATES® tests Pilates prowess in a cardiovascular, fat burning session, while our BigPiano classes train your brain, speed, agility and quickness in a light-hearted mini-cardio class! Please arrive 15 minutes early for your first class. I liked Emily’s class! Not as challenging as usual on Saturday with Katie but still good. Jay was awesome ! Motivating and pushed me to my limit. Best workout in only 40 minutes. Maria is such a great instructor. very attentive to everyone in the class and made the class a lot of fun. looking forward to the next one. One on one with the instructor!